Review of Dieu Du Ciel Péché Mortel | Beer Apprentice - Craft Beer News, Reviews, Interviews and Info. Hello everyone. Thanks for checking back in on another craft beer review. 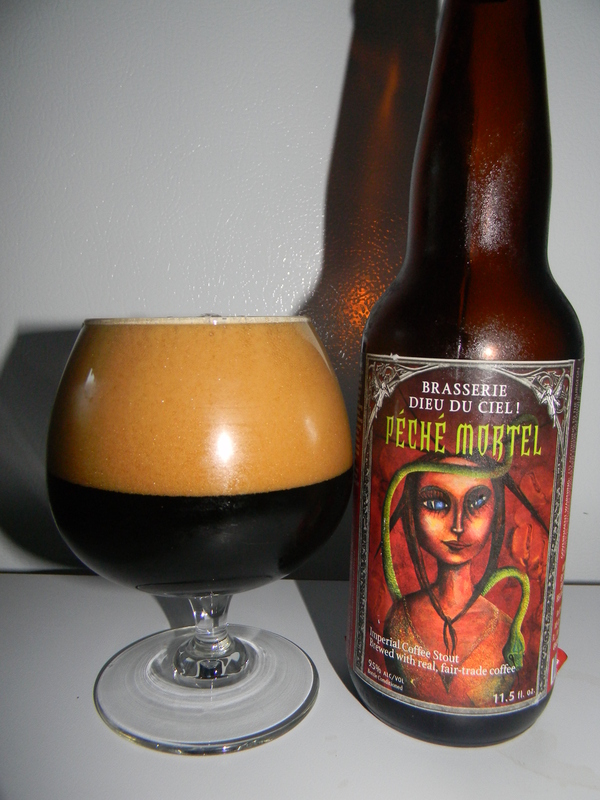 For today’s drinking pleasure I’m going to be sampling the Péché Mortel made by the Brasserie Dieu Du Ciel located in Montreal, Quebec, Canada. This brew has been reviewed by a ton of people and it always receives great praise, therefore I figured I’d toss in my two cents worth as well. If you recall, I love Coffee Stouts, so I’m excited about trying this one. The website, dieuduciel.com, had this bit of info for us. Péché Mortel (French for “Mortal Sin”) is an intensely black and dense beer with very pronounced roasted flavours. Fair trade coffee is infused during the brewing process, intensifying the bitterness of the beer and giving it a powerful coffee taste. Péché mortel is brewed to be savored; we invite you to drink it in moderation. This brew came in an 11.5 oz. bottle and it possessed an ABV of 9.5%. It poured jet black. No highlights at all were seen. It had a super sized khaki colored head that was smooth, extremely creamy and soft. The retention time was astounding and the lacing was fantastic. Simply, a very inviting and beautiful looking beer. The bouquet dispensed a very pleasant fresh coffee bean waft accompanied by tones of dark chocolate. Lighter hints of sugary molasses and earthy tones added some intricacy while an appropriate level of alcohol was found deep within. Nice. The taste seemed to be more espresso like rather than straight coffee. Savors of roasted grain and malt were discovered as well. A splash of vanilla was exposed as it began to warm. More of the sugary molasses was ascertained also, however the bittersweet dark chocolate seemed to be muted somewhat. It was still there, but it wasn’t as strong an aspect as it was in the fragrance. The mouthfeel was full bodied. Dry, chewy, smooth and a tad bit chalky. The carbonation was medium to low. A solid shot of warmth was felt, due to the alcohol, at the back of the throat and on into the belly. An excellent amount of flavor was left drenching the palate after each sip too. Well, I thought this to be a very, very, very nice and enjoyable beer. Definitely one of the better Coffee Stouts out there in my opinion. Obviously, this is more of a “cool weather sipper”, yet I would recommend it no matter what time of year it was if you have yet to taste it and you saw it in the bottle shop. Without a doubt, I’ll seek it out again. Have you guys tried the Dieu Du Ciel Péché Mortel? What did you think of it? Is it one of your favorite Coffee Stouts? Feel free to leave a comment and tell me of your opinion if you would like.